Many hugs & love for the support during my difficult time lately & it’s time to get back to business. I’ve missed most of this awesome event since it started & you only have one more day! Beautiful Freak has a FREE wearable demo/promo of her Digital Eyes at the event! It comes with system & prim eyes in one iris size & feature a digital circuit pattern in a muted jade green. @->~ISD has a dollarbie demo/promo of her DarkNet items in white! This promo contains rigged mesh hair, head tattoo, & a cool visor with circuitry patterns. Male & Female versions are available separately. Top six we have Beautiful Freak‘s Digital Eyes & PMD‘s Era Eyes. The Digital eyes cost $150L for the multicolored 10-pack & $75L for each 5-color pack.. The Era eyes cost $100L each 4-pack. Bottom six we have Chop Shop!‘s Game On! & The Orchids eyes. These eyes are $50L each or $450L each fat pack. Lastly, my own FutureWave offerings! The Citadel eyes are available as fat pack only for $200L. The Radar Contacts are special priced for only $25L! This is really one of the best events held in long while in my opinion. Everything is top notch & high quality! If you love original sci-fi & cyberpunk, do not miss this event! Check out what people are wearing at FutureWave’s Flickr Pool. FutureWave ends tomorrow, so get to shopping fast! While things are slow, I took the time to do futuristic themed shopping and came across DiGi. I found these great animated tech style optics! They come with left, right, & both versions, completely modifiable & tintable. If you’re into sci-fi themed RP like Tron worlds, these make wonderful accessories. The store specializes in “holographic” attachments to wear over any clothing. Most of their products are very affordable & there are dollarbies & freebies available. 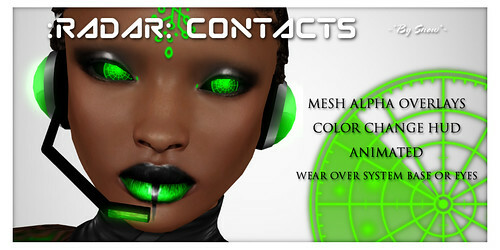 I just have to show you these awesome scifi shades by Contraption for Collabor88‘s May collection! Faust is the special guest this month & he made them especially for C88. The theme is “Rain or Shine” and they fit the theme perfectly! 100% original mesh, fully mod, they feature highly detailed textures & unique glow tips. You want them, you know you do! Chus! has a new gift in her group notices! They were sent as a preview of her new Sonata pack & remind me of a kiwi sliced in half. The gift comes with system & mesh eyes in one iris size only. Would be a unique look on futuristic cyber-type avatars! Pixel sends her groupies gifts often, join today & enjoy! 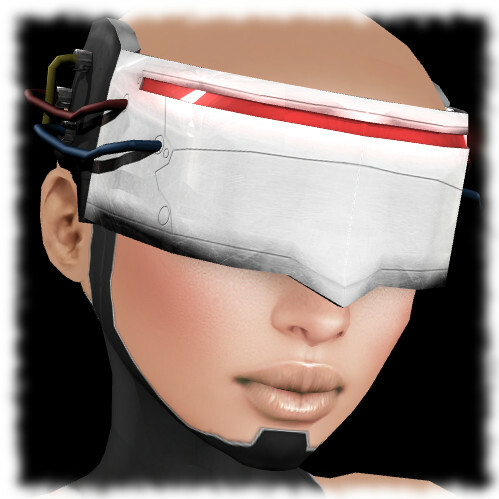 Umeboshi released a new eye pack at The Gallery Gift Shop for February! The mini pack features five dreamy colors with system & mesh versions in one iris size only. They are transferable and perfect for Spring! DownDownDown has an awesomely cool cyberpunk visor at The Gallery Gift Shop! 100% mesh, the colorful visor features a touch menu with ten different animated scrolling effects and controls for opacity, glow, & animation. It is also transferable for gift giving. Visit The Gallery Gift Shop collection today! I just have to show off the awesome creations from Contraption at the One Voice – Gala Fundraiser Event! Isn’t this visor just the coolest?! It’s 100% mesh and comes with a face sock tattoo. It is exclusive to the event so definitely get it for the cyberpunk in you! Faust’s second item in the event are the Pince Nez specs! Simply perfect for Victorian & Steampunk fans! These highly detailed specs are 100% mesh and you can choose from eight colors or buy the special edition fat pack. The event ends July 22nd, 2012!